High Threat Concealment HTC Low-Profile System (LPS) Modular Gunfighting Belt/Carrier System for Lo-Pro/Lo-Vis Tactical Ops! (Video!) | DefenseReview.com (DR): An online tactical technology and military defense technology magazine with particular focus on the latest and greatest tactical firearms news (tactical gun news), tactical gear news and tactical shooting news. 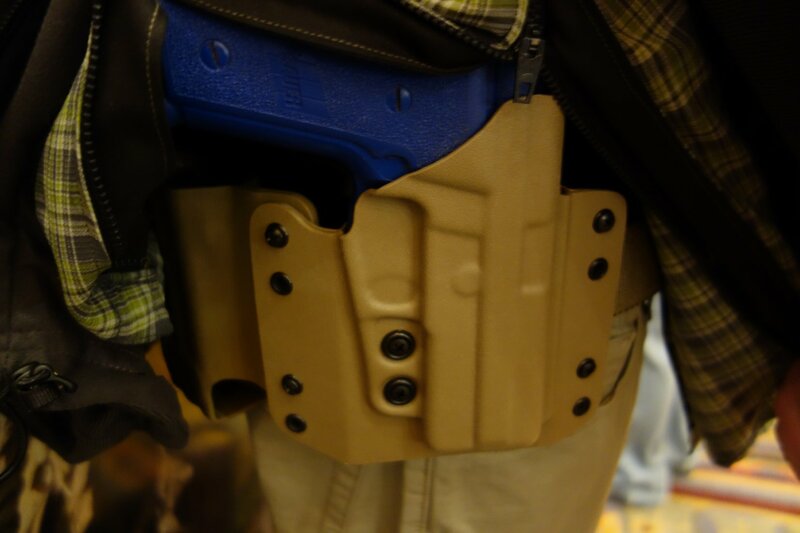 While we're on the subject of cool holsters, we should probably mention High Threat Concealment (HTC) Low-Profile System (LPS), which company owner James Overton was kind enough to take DefenseReview (DR) through at SHOT Show 2013. Overton designed and developed the LPS specifically for lo-pro/lo-vis tactical and PSD (Personal Security Detail) ops overseas, based on his experience during diplomatic security missions overseas. The HTC LPS was designed to function either as an outer tactical armor plate carrier replacement (everying except the armor) and/or to work in conjunction with a lo-pro/lo-vis carrier like the Rogue Gunfighter LVR (Low-Vis Rig) plate carrier. 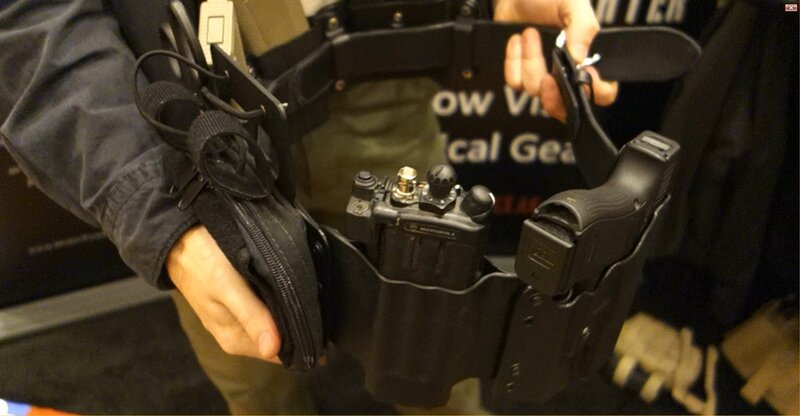 The modular part of the LPS relates to the HTC Modular Accessory Panel and HTC Connection Hardware Kit, which allow the user to connect up various polymer tactical gear carriers/pouches to the belt. Overton first showed DR the HTC Gen 3 Pistol Holster for the Glock 17/22 pistol, which incorporates an adjustable tension system, first. Next up was the HTC Blowout Kit quick-attach medical kit designed to be worn in the small of the back and be ambidextrous, so it's accessable by either hand. The HTC Gen 3 Radio Holder, also polymer, looked well designed, as it eliminates a Motorola tactical radio from being hot-mic'd. The radio just snaps right in. The HTC M4 Mag Holder AR rifle mag carrier/pouch is a universal-type that will take standard USGI mags, MagPul PMAG's, Lancer AWM's (Advanced Warfighter Magazine), and the Troy BattleMag. There's also a HTC Surefire 60 Rd. M4 Mag Holder, which is great. The HTC Dual Pistol Mag Holder is also universal, so it will take any double-stack .40 S&W or 9mm Parabellum/9x19mm NATO pistol mag. HTC also makes a 1911 pistol mag version of the double mag pouch. The HTC Gun Belt looks like a standard leather dress belt (albeit a wide one), so the wearer can maintain a low profile. This belt is part of an over-belt/under-belt system, where the outer belt attaches to the inner belt via velcro. 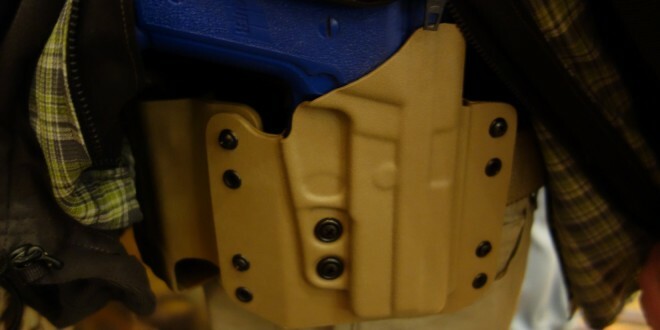 The inner belt is the one that goes through the belt loops, so you can just unloop the belt buckle and pull the out belt right off, making the outer belt a QD (Quick-Detach) gun belt. 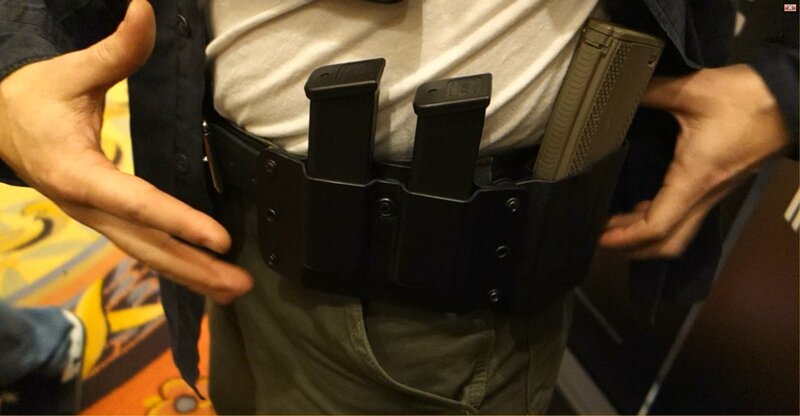 The company also offers the HTC EDT (Everyday Tactical) Belt. 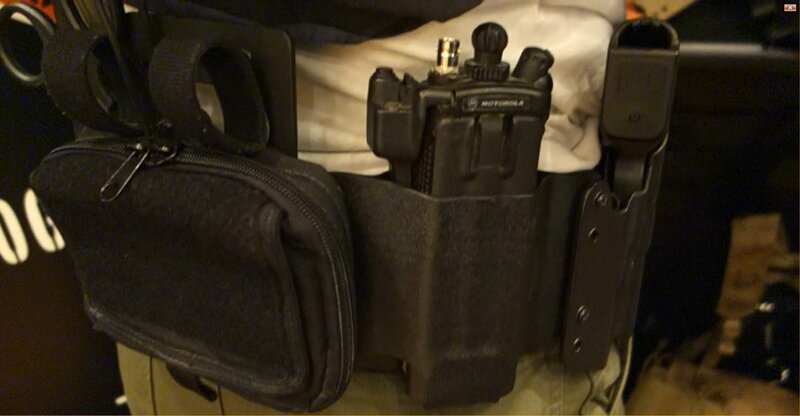 Assuming the HTC Low Profile System is both comfortable and durable for all-day/everyday wear, anyone looking for a lo-pro/lo-vis Batman Utility Belt-type tactical belt would be hard-pressed to find a better-designed gun belt/tactical gear carrier system. It's a well-thought-out system.